In New Neapolitan Novel, Fans Seek Clues About Mysterious Author's Past Elena Ferrante is the pen name of an anonymous Italian author. Very little is known about her, but Ferrante's books — widely believed to be a thinly veiled autobiography — have achieved cult status. The Naples in Elena Ferrante's Neapolitan novels isn't the Italy you see on postcards. The neighborhood she describes in vivid detail is poor and unglamorous — and it may or may not be based on the neighborhood where she herself grew up. Ferrante is actually a pen name and very little is known about the true identity of the author. She does almost no publicity, but that hasn't stopped the books from achieving cult status. 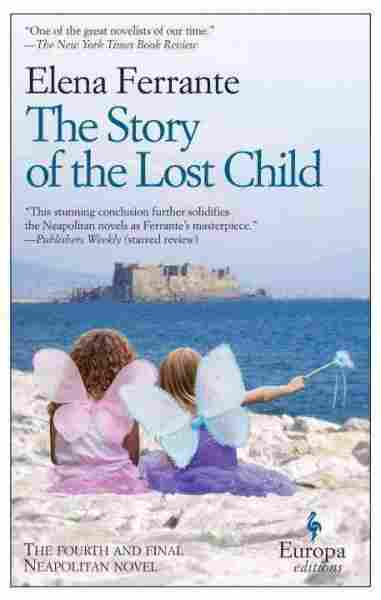 Her latest, The Story of the Lost Child, comes out on Tuesday. No one knows for sure, but the books are widely believed to be Ferrante's thinly veiled autobiography. The first-person narrator is named Elena. She's also an accomplished writer, reflecting on her youth in postwar Naples, and her constant struggle to flee the poverty and violence, even as the place keeps pulling her back throughout her life. At the center of it all is her complicated relationship with Lila, her lifelong best friend. 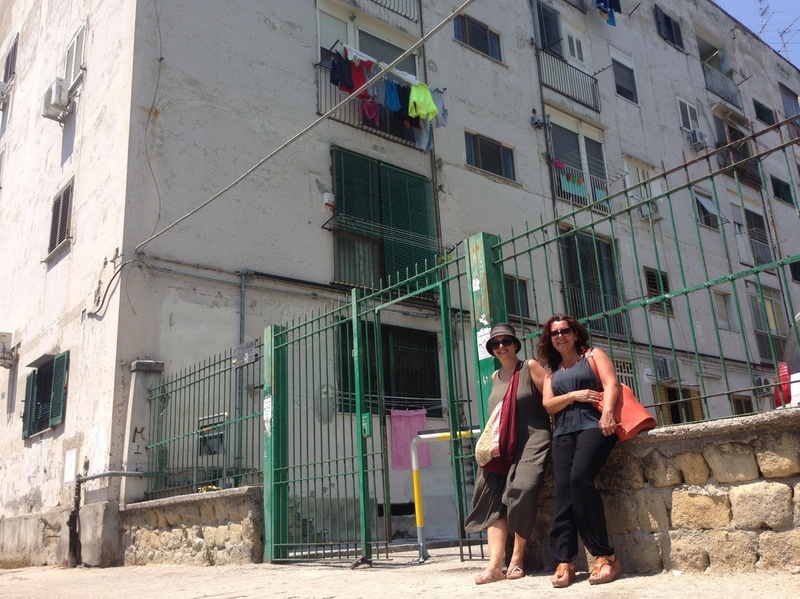 My guides today — Carmen Vicinanza and Lia Polcari — are locals, and longtime friends themselves. ("We look like teenagers but we're not," Vicinanza says with a laugh). They've promised to take me to what they claim is Ferrante's childhood neighborhood. We start out at a tunnel which functions in the books as a link from the neighborhood to the outside world. Next stop is the Parrocchia della Santa Famiglia — the Parish Church of the Sacred Family. Inside the grounds is a courtyard like the one where Ferrante's protagonists played as little girls. Polcari owns a bookstore devoted to women's literature, and formed an artist collective that creates work inspired by Ferrante's Neapolitan Novels series. She points out that the author doesn't name the neighborhood in any of the books, but the clues are all around us. She takes us to the only café in sight. The owner is a man in his 80s, who says he's never read any of Ferrante's books. That makes him the perfect person to ask about some of the clues we're pursuing. Like the first car in the neighborhood? "It was a Fiat 1100. The owner went a little bit out of his mind," the shop owner says. We're floored. It's as if he were talking about Marcello Solara, a villain in all four of the Neapolitan Novels. The uncanny similarities pile up: His nephew points out that the local shoemaker was named Gennaro and went by the nickname Rino. Even the owner is surprised by how much we know. "Does the book mention me?" he asks. (He probably wouldn't want it to — the café owner in the books is a Mafioso). As we get ready to leave, he recalls that a Ferrante family lived nearby, past the public gardens, across the street in the run-down, four-story white apartment buildings. The building matches up almost perfectly with the description from the book. Naples locals Lia Polcari (right), Carmen Vicinanza (left) in front of what they believe to be the childhood home of author Elena Ferrante. We enter a courtyard and a group of women peer down from a balcony. One of my guides tells them we're looking for a writer. One of them responds: "Ah, you're looking for Ferrante, who lived here many years ago? They moved. But this is the house where she was born. There, on the first floor." My guides are elated. "We found it! We found it!" they rejoice. But wait a minute. If Ferrante is her pen name, what exactly have we found? Was it also her maiden name? Are they pulling our legs? Ferrante has never once appeared publicly in 23 years of publishing. She only does interviews via e-mail. There's been much speculation about her true identity. The women on the balcony think they remember her first name — Anna. One published theory claims Ferrante is really Anita Raja, Anita being the diminutive of Anna. Raja is a consultant for Ferrante's Italian publisher. She is also the wife of the Neapolitan writer Domenico Starnone, who himself has been "accused" of being Elena Ferrante. Her editors deny it all. "They say the darndest things," says editor Sandra Ferri. Ferri understands that reclusive authors tend to arouse curiosity and that could lead to sales. "It's not about marketing," Ferri insists. "Every now and again someone will say, 'Ah, what a sly move to publish the books with a pen name, Ferrante is clever.' I tell them, 'OK. Anyone can publish with a pen name and never reveal himself. Why don't you do it? Let's see how many people have the same results.'" And, she warns, Ferrante's secrecy gives her the space she needs to create. The author has said that if she were forced to reveal herself, she wouldn't stop writing, but she'd stop publishing. And that would be a tragedy, say my guides. And besides, Vicinanza says, it doesn't really matter who Ferrante is anyway. "It's fun, but I don't think that the mysterious writer made the success of the book," Vicinanza says. "I guess that the book is so strong that even without the presentation, the face of the writer, it goes and it has this success. It's the first case where the book is stronger than the writer, than the person. In this society, where writers are important, they are everywhere, on TV. ... Without presentation, without interviews or anything, the books had all this success." After all, she adds, we wouldn't be outside on a hot day roasting in this far-flung, little neighborhood if these books were anything less than superb.